She was advertised as "one of the nation's leading experts on paying for college," and her recent presentations at local libraries were polished. But it turns out that Nichole Buendia, 28, has no work experience in the field of college financial aid. The former mortgage solicitor may be more familiar with Hawaii's court system, having been sued 10 times for alleged financial misdealing. With college tuition costs soaring, families are desperate for help in paying for their children's education - but they need to be wary of sharing their personal financial information with strangers. 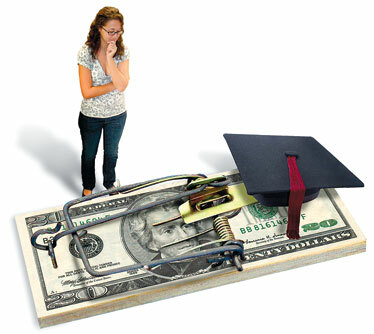 "In the college counseling profession, it is always a red flag when you hear about people paying for help getting financial aid," said Derrick Kang, director of college counseling at Mid-Pacific Institute. "Because all that is available free." Like many parents of high school students, Grace Sato is concerned about how she's going to pay for college for her son, a freshman at Kailua High. So when she received a glossy card in the mail inviting her to a free presentation on the subject at a local library, she went. The perky, attractive woman leading the workshop, Nichole Buendia, described applying for financial aid as a maze. She urged people to bring in their bank statements and tax returns for one-on-one consultations. Nichole Buendia, 28, has been soliciting customers for her "expert" advice on getting financial aid for college but has no formal background in that field and has been sued numerous times for financial misdealing. She was also convicted of perjury last year. "It seemed OK," Sato said, and she signed up. What Sato didn't know was that Buendia has never worked as a college financial aid counselor, despite publicity materials touting her as "one of the nation's leading experts on paying for college." And Buendia's life experience hardly qualifies her to offer anyone advice about money. A former mortgage solicitor, the 28-year-old Buendia has been sued 10 times in Hawaii courts for alleged financial misdealing, according to a Star-Bulletin review of court files. In October she was ordered to repay $19,471 to Bank of Hawaii after fraudulently taking out a loan using a client's name, birth certificate and Social Security number. Two other financial institutions won judgments against her this year for failing to repay her debts. She is being sued in federal court over "truth in lending" allegations. Last year, in a separate case, she was convicted of four counts of perjury, a felony, and is still on probation for it. Previously, the state found her liable for collecting unemployment benefits she didn't deserve. As families scramble for ways to pay for the soaring cost of college, they may become more vulnerable to questionable sales pitches. Professionals in the field of college counseling warn students and parents to be wary of independent operators who offer to help students get financial aid for college, for a fee. "You need to be very careful with anyone who's charging," said Frank Green, longtime board member of the Pacific Financial Aid Association, who coordinates free financial aid nights at high schools statewide. "All of this information is available free ... It's natural that people open up companies to try to help people and do this for them, but it really is preying on the unsuspecting, I'm afraid." Some parents said the presentations had an air of legitimacy because they were being held at public libraries. But anyone can rent a library meeting room, noted Holly Kwok, head librarian at Aina Haina Public Library. "People might get the impression that we're supporting this group, but it's actually not the case," she said. "They're just using our facility." Buendia was the featured speaker for a series of workshops last month held by College Planning Specialists Hawaii LLC, a for-profit company formed last year by Shane Sarae. He said he met Buendia when they both worked for Charter Funding of Hawaii, a mortgage company that shut down last year. He wasn't aware of the extent of her court history and told the Star-Bulletin he finds it "disturbing." Sarae, 44, insists that his company wants to provide a legitimate service by helping families get more financial aid and steering their teens to colleges with the best track records of awarding grants. The company offers a money-back guarantee, he said. "There's rules to this game and if you know them, you can play the game better," he said. "My passion is to be a coach or a mentor to a student. It's to help someone not make the same mistakes I did." Sarae said he spent 6-1/2 years getting a degree in economics at the University of Hawaii and then went back for accounting classes, only to discover that he disliked the field. While he hasn't worked as a college planner before, his company is using a program created by Ron Caruthers, head of College Planning Specialists Inc. of Carlsbad, Calif., and has hired Caruthers as its coach and consultant on its cases. They met at a seminar Caruthers gave on "multiple streams of income." Sarae's firm made its first marketing push this summer, sending out 4,000 brochures to families of high school students on Oahu. The workshops promised to highlight "little-known ways of getting money for college" and "how to double or triple your eligibility for free grant money." The presentations gave few specifics, but offered to help families qualify for more financial aid on the federal application form by repositioning their assets so they appeared less well off. Sarae and Buendia handed out gift certificates for a free one-hour consultation "valued at $475." Asked what their fees would be after that, Buendia said "a couple hundred to a couple thousand dollars." At one point during the Aug. 16 workshop in Kalihi, Buendia suggested that parents need not list second homes as assets on the form: "They don't count your primary residence, but if you have a second home out there, and you list the value in that, it doesn't say you have to list it. But if you go ahead and list it, then you're ineligible for financial aid," she said. The federal form, however, clearly states that families must list their real estate other than the family home. It warns that "if you purposely give false or misleading information you may be fined up to $20,000, sent to prison, or both." Asked about that discrepancy, as well as her billing as a "national expert" on a press release, Buendia said she was simply parroting Caruthers' scripted package. "They give us the press releases, they give us education," she said. "They tell you exactly what to say, word for word, line by line. The training they give us is to state that you're an expert in your field." She said if her background raises questions about the company, she would step aside because "I don't want to ruin it for Shane." Asked for comment, Caruthers said Buendia's statement about second homes was wrong. Such assets must be listed and, depending on their equity value, may not preclude receiving financial aid. He said the Hawaii company should have adjusted his press release to their situation. Caruthers expressed surprise at Buendia's court history. Although he has been a college planner for 16 years, he said, he began training others to start their own businesses just a couple of years ago. "We did a thorough background check on Shane," he said. "We vet the principals. ... My procedure manual is getting rewritten right away." The press release also described Caruthers as author of "How to Get Your Child a 4-year College Education Without Going Broke." That title resembles a comprehensive 350-page guide put out annually by Princeton Review/Random House called "Paying for College Without Going Broke." But Caruthers' booklet is quite different. An Internet search reveals that at least 20 other people, scattered across the United States, all claim to be its author. Most cite it as a credential in trying to build their own college planning businesses. The title is not available in bookstores or local libraries and doesn't show up at booksinprint.com. Caruthers said he had self-published it, then shared it, but things got out of hand and so he stopped. Sally Nhomi Mennella, scholars program manager for Gear Up Hawaii, a federal program to help low-income students go to college, attended one of last month's workshops and was dismayed. "A lot of the information they were giving was available for free, and some of what they were saying was misleading and inaccurate," Mennella said. "I was so upset because every year we hear horror stories of families, after the fact, telling us they paid thousands of dollars in college prep help that turned out not to be helpful or in some cases harmful." Grace Sato's free individual consultation with Sarae's company hasn't been scheduled yet, but she was taken aback at the "$475 value." "That's like way out of my league," Sato said. "I even talked to my girlfriend about it and she said, 'Go to the one-hour thing, get the information, but don't sign up for anything, don't give them anything.'" Here are some sources of information to help prepare and pay for college. Official Web sites on applying for college and student financial aid. A federally funded project to help more of Hawaii's teenagers get ready for college. Includes information on applying and paying for college. This professional association sponsors college planning workshops. The foundation has more than 150 different scholarship funds for Hawaii residents. This professional association sponsors financial aid programs for students and families statewide. Hawaii residents may attend these colleges and universities in the western United States at reduced tuition. First Hawaiian Bank and the Hawaii Association for College Admission Counseling will hold free workshops for students in grades 9-12 and their families on preparing for, choosing and paying for college. Families may attend any presentation and will receive a workbook, "College Planning: A Family Affair." will hold financial aid workshops at high schools statewide. Here is a preliminary schedule, with more campuses to be added. Call Frank Green, 591-2708, for more information. Students and their families may attend any workshop.